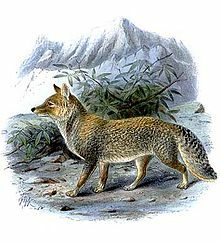 The Tibetan sand fox (Vulpes ferrilata) is a species of true fox endemic to the high Tibetan Plateau, Ladakh plateau, Nepal, China, Sikkim, and Bhutan, up to altitudes of about 5300 m. It is classed as of "least concern" for extinction by the IUCN, on account of its widespread range in the Tibetan Plateau's steppes and semi-deserts. It is sometimes referred to as the Tibetan fox, or simply as the sand fox, but this terminology is confusing because the corsac fox (Vulpes corsac), which lives in arid environments north and west of the Tibetan Plateau, is often called the "sand fox" or "Tibetan fox" as well. The Rüppell's fox (Vulpes rueppellii) is also known as the "sand fox",but is native to arid desert regions of North Africa and Middle East. Tibetan foxes are small and compact, with soft, dense coats and conspicuously narrow muzzles and bushy tails. Their muzzles, crowns, necks, backs and lower legs are tan to rufous coloured, while their cheeks, flanks, upper legs and rumps are grey. Their tails have white tips. The short ears are tan to greyish tan on the back, while the insides and undersides are white. Adult Tibetan foxes are 60 to 70 centimetres (24 to 28 in), not including tail, (juveniles are somewhat smaller) and have tail lengths of 29 to 40 centimetres (11 to 16 in). Weights of adults are usually 4 to 5.5 kilograms (8.8 to 12.1 lb). Among the true foxes, their skulls are the most specialised in the direction of carnivory; they are longer in their condylobasal length and in mandible and cheek tooth length than those of hill foxes. Their cranial region is shorter than that of hill foxes, and their zygomatic arches narrower. Their jaws are also much narrower, and their foreheads concave. The canine teeth of Tibetan foxes are also much longer than those of hill foxes. The Tibetan sand fox is restricted to the Tibetan Plateau in western China and the Ladakh plateau in Northern India. It is found across Tibet, and in parts of the Chinese provinces of Qinghai, Gansu, Xinjiang, Yunnan and Sichuan. Outside of China, it can be found in northern Bhutan, and in the northernmost border regions of Nepal and India, north of the Himalayas. No subspecies are recognised. The sand fox is found primarily in semi-arid to arid grasslands, well away from humans or from heavy vegetation cover. It inhabits upland plains and hills from 3,500 to 5,200 metres (11,500 to 17,100 ft) elevation, although it is occasionally seen on lower ground, down to 2,500 metres (8,200 ft). They primarily prey on Plateau pikas, followed by rodents, marmots, woolly hares and lizards. They may also scavenge on the carcasses of Tibetan antelopes, musk deer, blue sheep and livestock. Tibetan foxes are mostly solitary, daytime hunters as their main prey, pikas, are diurnal. Tibetan foxes may form commensal relationships with brown bears during hunts for pikas. The bears dig out the pikas, and the foxes grab them when they escape the bears. Mated pairs remain together and may also hunt together. After a gestation period of about 50 to 60 days, two to four young are born in a den, and stay with the parents until they are eight to ten months old. Their burrows are made at the base of boulders, at old beach lines and low slopes. Dens may have four entrances, with entrances being 25–35 cm in diameter. Tibetan foxes in the Sêrxü County of China's Sichuan province are heavily infected with Echinococcus, while foxes in western Sichuan are definitive hosts of alveolar hydatid disease. ^ Schaller, G.B. ; Ginsberg, J.R. & Harris, R. (2008). "Vulpes ferrilata". IUCN Red List of Threatened Species. Version 2008. International Union for Conservation of Nature. Retrieved 22 March 2009. ^ Hodgson, B. H. (1842). "Notice of the Mammals of Tibet, with Descriptions and Plates of some new Species". Journal of the Asiatic Society of Bengal. 11 (124): 278–279. ^ a b Harris, R.B. ; Z.H. Wang; J.K. Zhou & Q.X. Liu (2008). "Notes on biology of the Tibetan fox (Vulpes ferrilata)" (PDF). Canid News. 11: 1–7. ^ a b Clark, H.O. ; et al. (2008). "Vulpes ferrilata (Carnivora: Canidae)". Mammalian Species: Number 821: pp 1–6. doi:10.1644/821.1. ^ Liu, Q.X. ; R. B. Harris; X.M. Wang & Z.H. Wang (2007). "Home range size and overlap of Tibetan foxes (Vulpes ferrilata) in Dulan County, Qinghai Province". Acta Theriologica Sinica (in Chinese). 27: 370–75.